„Where did all the children go?“ says the BBQ chef. They are all standing around the pizza oven, making their own pizza's. Simple to use, great taste! Take it with you to the beach or the park. A warm place for cool evening turns into an outdoor kitchen. Bake your breakfast bacon and eggs, toast cheese sandwiches or cook a romantic garden supper. 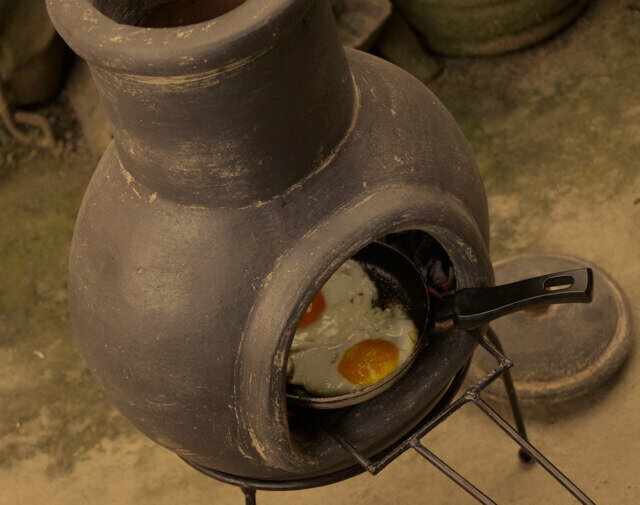 Grill on the top part of the chimenea and at the same time bake, stew of grill in the mouth of the chimenea. Or have your Tortilla's warming on top and your steak grilling in a skewer on the Cookout Base. This is the ultimate BBQ king. Encore! The French call it gourmet cooking. Grill on the table as you are eating. The amazing Aztec BBQ grills a lot of food in little time because of its excellent isolating clay shell. Work the coals through the mouth while you grill on top. The fire dances in the stone fire pit as the stars slowly move to the west. A frosty evening is turning into a cozy get together in the open air. A few potatoes sitting next to the fire in the bowl are anxious to meet some french onion dip. Enjoying the small fire on the table. The light of the fire reflecting over table. Mike places a casserole with hot-dogs and sauerkraut on the Cookout-base in the chimenea. Cookout-Party time. Eating outside is more than a BBQ. European designs, handmade by the Sol-y-Yo Artisan community, based in the Mexican highlands. Clay, water and fire. 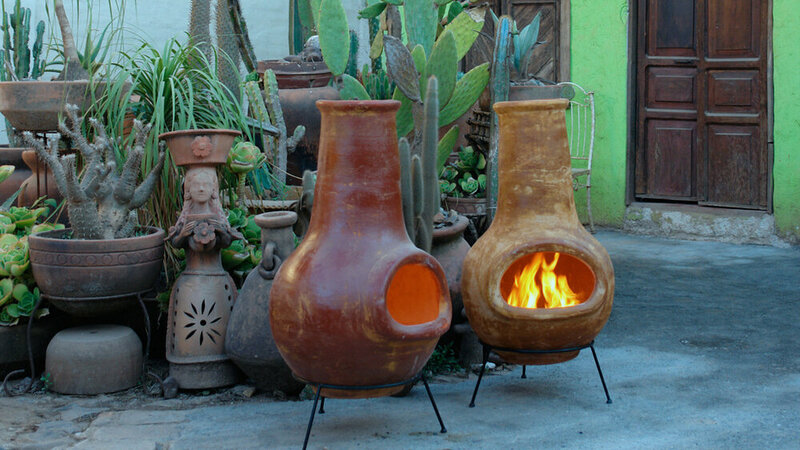 Relax outside with the classic Sol-y-Yo® Chimeneas. 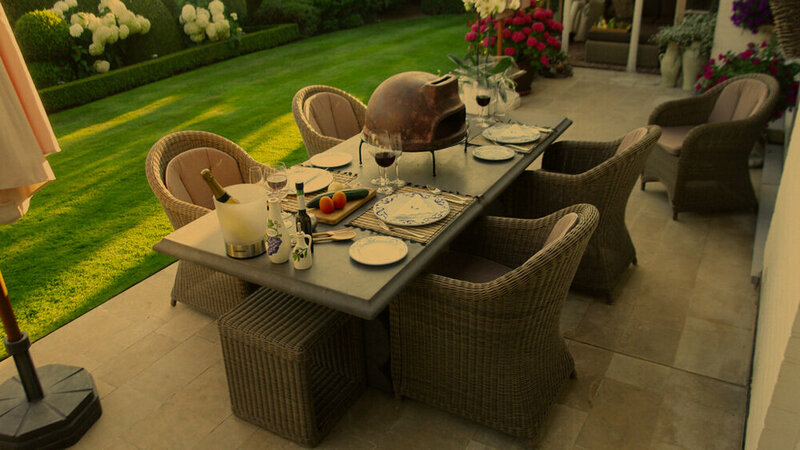 The Sol-y-Yo® concrete grey Chimenea looks great with modern garden furniture. Make some food for your friends. Bake your own pizzas at your garden table with the Sol-y-Yo® Pizza Oven. Make your own pizza, place it in the oven and see it bake. Burn wood for warmth or place the cookout base and make food or a snack. Cooking together, eating together, laughing together. If you have any questions, please do not hesitate to contact us. We will reply to your message as soon as possible. Please note that we sell to wholesalers and retailers only. More information about the order procedure can be found here.